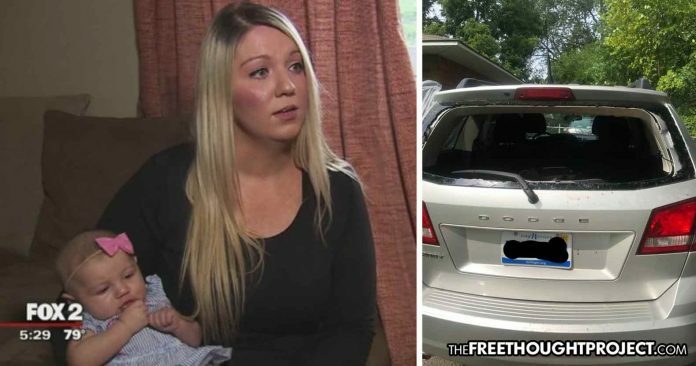 A panicked mother begged 911 to come and break her window after her car malfunctioned and her baby got locked inside, but police refused, twice. Waterford, MI — A mother took to Facebook this week to express her anger and shock, after she dialed 911 for help to rescue her baby — who was trapped in a hot car — and police essentially told her to get lost, twice. The incident happened Saturday when Lacey Guyton was leaving her grandparents’ home in Waterford and she strapped her 2-month-old daughter Raina into her carseat for the ride home. After closing the door, Guyton walked around to the other side to get in, but she said she heard the doors “randomly lock” before she made it to the driver’s seat. Although she has a vehicle that is supposed to prevent the owner from locking their keys in the car, this feature apparently malfunctioned and her keys were locked inside the car, in her diaper back — along with the baby. Because the car had been sitting in the driveway the entire time Guyton was inside visiting her grandparents, it had become extremely hot inside which was like putting the baby into a sauna. Guyton immediately found a rock and began banging on the glass to break the window, but it wasn’t working. As she beat the rock on the window, her grandmother dialed 911. And, when the panicked duo told police a 2-month-old baby was locked in a hot car, police responded by saying they don’t send officers to unlock car doors. Had Guyton told 911 that there was a man smoking an illegal plant in that car, rest assured, cops would’ve swarmed the house in no time flat. But a trapped baby was simply not a reason to help. As Guyton explained in her Facebook post, she called back a second time to beg 911 to send someone to break her window. “I didn’t have time to wait for a tow company as my baby is screaming and getting hotter in the car. So I called 911 back and told her again my 2 month old is locked in a hot car and asked her to PLEASE send a fire rescue just to smash my window. I didn’t care to wait for someone to unlock the door obviously I just wanted my windows smashed and my baby out. Again she told me she would transfer me to a tow company because they don’t send anyone out to break windows or unlock cars,” she wrote. “I decided to at least ask the tow company to come while I kept trying to break a window. I checked on Raina again real quick and saw she stopped crying and was starting to close her eyes and at this point I didn’t know if she was going to sleep or if my baby was dying,” Guyton wrote on Facebook. Finally, after banging on the back glass long enough, Guyton was able to break through. After she broke the window, Guyton crawled through the broken glass, manually unlocked the door and was able to get her baby to safety. After Guyton told her story to FOX 5, the police chief did something unexpected—he apologized. Guyton says she appreciates the apology but noted that it is a bit too late. “I do appreciate their apology,” Guyton said. “But it’s not something that needs any training to know it’s common sense. You send help when someone is begging you to come help them save their child out of a hot car. Indeed. Luckily, this time the mistake did not cost an innocent child her life. As TFTP has reported in the past, that is not always the case.